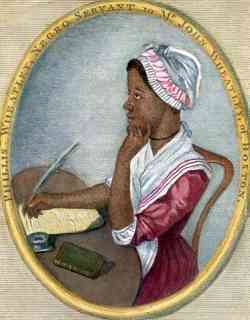 In 1761 Phillis was purchased as a personal slave in Boston by Susannah Wheatley, wife of tailor John Wheatley. She was evidently around 7 years old at the time. Her only written memory of her birthplace was of her mother performing a ritual of pouring water before the sun as it rose; biographers conjecture she came from Senegal/Gambia and may have been a Fula, a Moslem people who read Arabic script. Very likely she was kidnapped into slavery and brought on a slaving vessel on the Middle Passage. She learned to speak and write English very quickly, taught by Mary Wheatley, the 18 year old daughter of her owner; within 16 months she could read difficult passages in the Bible. At 12 she began studying Latin and English literature, especially the poetry of Alexander Pope, soon translating Ovid into heroic couplets. These would have been remarkable accomplishments for an educated white male boy, and was virtually unheard of for white females. She may well have read Anne Bradstreet's poetry. The Wheatleys appreciated her talents, and showed her off to their friends; many came to visit with this "lively and brilliant conversationalist." She was thoroughly indoctrinated into Puritanism. Phillis's place was designated by her white world, and she was virtually cut off from her own people, but she was definitely still a slave, although a privileged one. Though superior to most in her intellectual and literary accomplishments, she was clearly never their social equal. Perhaps that accounts for her not adopting Pope's major literary characteristic--satire--although she did adopt his poetic forms and classical allusions. Nevertheless, modern feminist critics have pointed out her subtle and hidden critical messages (which would have had to have been well hidden, so as not to offend the white benefactors upon whom she had to depend). At the age of 20, the Wheatleys sent her to England for health (and exhibition?) reasons with her "young master," Nathaniel Wheatley, who was traveling on business. Her poem to Mrs. Wheatley suggests her affection for her: "Susannah mourns, not can I bear,/ To see the crystal shower, /Or mark the tender falling tear, /At sad departure's hour;"While there, her poetry, 'Poems on Various Subjects, Religious and Moral" was published and dedicated to her English patron, Lady Huntingdon. She noted the hope that under her patronage "my feeble efforts will be shielded from the severe trials of uppity Criticism." Attached to the volume was a statement from 18 prestigious Boston residents, as well as testimony from John Wheatley attesting to its authenticity:"The following is a Copy of a LETTER sent by the Author's Master to the Publisher. Phillis was brought from Africa to America, in the Year 1761, between Seven and Eight Years of Age. Without any Assistance from School Education, and by only what she was taught in the Family, she, in sixteen Months Time from her Arrival, attained the English Language, to which she was an utter Stranger before, to such a Degree, as to read any, the most difficult Parts of the Sacred Writings, to the great Astonishment of all who heard her. As to her WRITING, her own Curiosity led her to it; and this she learnt in so short a Time, that in the Year 1765, she wrote a LETTER to the Rev. Mr. Occom, the Indian Minister, while in England. She has a great Inclination to learn the Latin Tongue, and has made some Progress in it. This Relation is given by her Master who bought her, and with whom she now lives. John Wheatley. Boston, Nov. 14, 1772." The following letter appeared in Connecticut Gazette, March 11, 1774, written by Wheatley to Reverend Samson Occum, 11 February 1774: "I have this Day received your obliging, kind Epistle, and am greatly satisfied with your Reasons respecting the negroes, and think highly reasonable what you offer in Vindication of their natural Rights: Those that invade them cannot be insensible that the divine Light is insensibly chasing away the thick Darkness which broods over the Land of Africa; and the Chaos which has reigned so long is converting into beautiful Order, and reveals more and more clearly the glorious Dispensation of civil and religious Liberty, which are so inseparably united, that there is little or no Enjoyment of one without the other: Otherwise, perhaps the Israelites had been less solicitous for their Freedom from Egyptian slvery; I do not say they would have been contented without it, by no means, for in every human Breast, God has implanted a Principle, which we call love of Freedom; it is impatient of oppression, and pants for Deliverance--and by the Leave of our modern Egyptians I will assert that the same principle lives in us. God grant Deliberance in his own Way and Time, and get him honour upon all those whose Avarice impels them to countenance and help forward the Calamities of their fellow Creatures. This I desire not for their Hurt, but to convince them of the strange Absurdity of their Conduct whose Words and Actions are so diametrically opposite, How well the Cry for Liberty, and the reverse Disposition for the exercise of oppressive power over others agree I humbly think it does not require the penetration of a Philosopher to determine." Wheatley did reach out to other artists of color and they to her, as this letter and her poem to Scipio Moorhead show. She was also an inspiration for Jupiter Hammon, another African writer in America. However, the death of Mrs. Wheatley in 1774 (whose illness required Phillis to return prematurely from London) and the Revolutionary war were to change her life drastically. War, not poetry, became the major concern, and many of her former patrons had dangerous British connections. She was freed after Mrs. Wheatley's death and married John Peters, but her life was chaotic. She wrote to her black friend Obour Tanner (who disapproved of the marriage) in 1778 (with her typically restrained style): "The vast variety of scenes that have pass'd before us these 3 years past will to a reasonable mind serve to convince us of the uncertain duration of all things temporal, and the proper result of such a consideration is an ardent desire of, & preparation for, a state and enjoyments which are more suitable to the immortal mind." Little is known of Peters, who was evidently handsome and educated, but unable to settle in any vocation. They lived in great poverty; she had three children and all died in infancy. She never found another patron for her poetry, though she continued to write poems, obscuring her own personal ordeals. She wrote over 100 poems, but at least 30 poems were evidently lost. Her long physical frailty, hard life and poverty led to her death at 31, with her third child dying shortly after. Some critics have been disturbed that her poetry is not more attuned to modern politlcal and racial awareness, that she seems to have adopted a "white voice" and abandoned her own race. This hardly seems fair, though it has led many to focus on the tragedy of her life rather than her poetry. Collins argues that her work should also be explored to see how the slave mentality affected her self-identity, although he acknowledges her slave condition was most unusual. Is she demeaning her own blackness in many poems, or is she establishing credibility based on her unique experience? She had to tread a very fine line--between her own feelings, her patrons and readers, and the Christian God in whom she devoutedly believed. African-American feminist poets, such as Alice Walker and Naomi Madgett, have claimed Phillis as inspiration, if not a poetic model. Then cease, my song, till fair Aurora* rise.